Regiment/Catrawd: 'C' Company 1st Battalion Border Regiment (Attached to 51st Battalion Northumberland Fusiliers). Military Cemetery/Memorial / Fynwent milwrol: St James's Church, Christleton, Chester, England. Ref No Grave or Memorial / Rhif cyfeirnod bedd: 18. Whilst supervising army recruits on the firing range, was accidently shot and killed, aged 21 years. John Lionel Percival Gamon was born in Bramley, Yorkshire on 14 April 1897 and baptised on 19 May 1897 at St Peter’s Church, Bramley, Yorkshire. The 1901 Census states that the family lived at Dee Royal, Telegraph Road, Heswall, Cheshire. The head of the family was Harry Percival Gamon aged 33, a Stocks and Shares Broker. His wife Ada M Gamon (nee Holroyd) aged 35 and theit two children – John Lionel Percival Gamon aged 3 and Harry Percival Gamon aged 7 months. Also living there and employed by the family was Margaret Hayes aged 24, a Cook and Alice Dixon aged 22, a Domestic Nurse. John was educated at St. Bees School, Main Street, Cumberland (now Cumbria). This Church of England School was founded in 1583. The family moved to live in Rhyl, Flintshire for a short time and then returned to Cheshire and lived at The Sycamores, Christleton, Chester. John Lionel Percival Gamon was commissioned into the Border Regiment and later attached to the Northumberland Fusiliers. He arrived in France with the Battalion on Tuesday 22 August 1916 and took part as a front line soldier in the Battle of Cambrai. On Tuesday 4 June 1918, whilst on home leave awaiting his return to the front he was engaged with training recruits in Redcar, Yorkshire, when he was accidently shot and killed. His funeral took place on Saturday 8 June 1918 at St.James’s Church, Christleton, Chester. 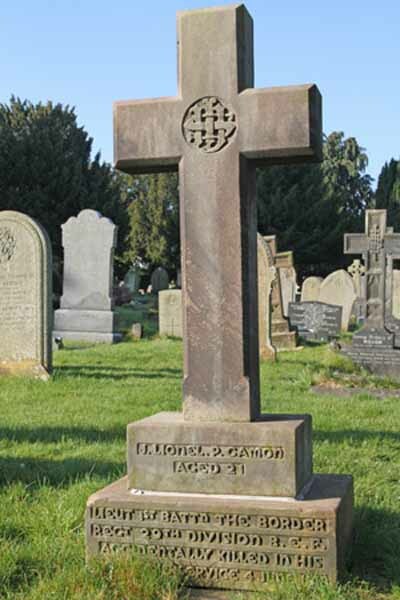 Photograph of the headstone of John Lionel Percival Gamon at St. James Church, Christleton, Chester. The National Probate Calendar for 1918, which was administered on 14 August 1918 at Chester states that John Lionel Percival Gamon on his death left the sum of £245.14s.9d to his father. On 25 January 1919, a payment of £4.7s.6d was made by the War Office to Mr Harry Percival Gamon, being monies owed to his son John. On 18 December 1919, a further payment which is recorded as a War Gratuity of £54.0s.0d was also made to him. John Lionel Percival Gamon is also remembered on a Memorial Plaque at St. Bees School, the Royal Alexandra Hospital, Marine Drive, Rhyl, Flintshire and on The North Wales Heroes Memorial Arch, Deiniol Road, Bangor, North Wales.